Oct. 22 — Look! Up in the sky! Bigfoot has sprouted wings, and he's coming your way. A bird the size of a small airplane, with a 14-foot wingspan — twice the size of an eagle's — mesmerized several witnesses last week in southwest Alaska, who compared it to a creature from Jurassic Park. Pilot John Bouker told the Anchorage Daily News he spotted the huge creature in the sky. "The people in the plane saw him," he said. At first he discounted the sighting, until he saw the huge creature with his own eyes, just 1,000 feet from his plane. "He's huge," Bouker said. "He's really, really big. You wouldn't want to have your children out." After another big bird sighting, a heavy equipment operator radioed the nearby town of Togiak, warning residents to protect their children, and causing more than a bit of unrest. The incident only underscored an important fact: Monster reports are not always a joke. A mysterious "monkeyman" menaced India last year, biting and robbing 60 people on the outskirts of New Delhi. In one 10-day period, police received 328 calls about the half-man, half monkey. They dispatched about 1,000 officers and imposed a curfew in one area. After an investigation, officials later declared the entire event was a hoax perpetuated by mass hysteria. In Alaska, local officials suspect that well-meaning witnesses may have overestimated the bird's size, and say that it may have been a Steller's eagle — a rare, fish-eating bird that's harmless to humans. Still, it's time to wonder, have we seen the last of Big Bird? Or do Bigfoot, Mothman, and the Loch Ness Monster have a new friend? With that in mind, let's check in some of our favorite monsters. Bigfoot Convention: Eric Altman says he won't rest until Bigfoot is protected under the Endangered Species Act. "I've seen the evidence — the footprints, the hair, the eyewitnesses. It's too much to discount," says the 32-year-old software designer and director of the Pennsylvania Bigfoot Society — one of some 40 groups dedicated to finding the mysterious beast. "Right now, I think it's critical that we get DNA tests on some of the hair we've collected." Bigfoot sighting are largely associated with the Pacific Northwest. But Altman said Pennsylvania ranks fourth among states, with more than 500 sightings dating to the 1800s — and his group has investigated more than 50 reports. "Even if 85 percent of the reports are hoaxes or easily explainable, 15 percent can't be explained," he says. "This is a worldwide phenomenon." Bigfoot is a bit like Elvis. He's an ongoing national obsession. He's large. And he gets around. In the last five years, a Bigfoot has been sighted munching on pinot noir grapes at a vineyard in Salem, Ore.; swiping lingerie from a trailer park in Ochopee, Fla; and menacing revelers on New Year's Eve 1999, in Tamworth, England. Perhaps "Mr. Bigfoot" is just a big hairy guy who gets drunk and wears women's underwear — the ultimate party animal. Certainly, much of the purported evidence turned out to be fabricated by pranksters in monkey suits. However, Altman is among those who believe there are unknown species of giant primates all over the world — known to us as "Sasquatch," "Yeti" and "the Abominable Snowman." About 120 attendees showed up last month for the fourth annual East Coast Bigfoot Conference and Expo, just outside Pittsburgh. Sale items included T-shirts, key chains and plaster casts of footprints — some with five toes, some with three. "You see souvenirs at any convention. That's just one way to raise money," Altman says. "But we're serious." Altman says he's never seen the beast. But he's heard mysterious sounds in the forest, and he knows it's out there. Loch Ness Web Cam: You can now hunt for the world-famous Loch Ness Monster right in your own bedroom, with the 24-hour Loch Ness Web Camera (see link in right column). The folks at Scotland Online might be milking the mysterious underwater creature for every tourist dollar imaginable. With a camera 750 feet below the water and another on the surface, you can try to confirm Nessie's status as "Lady of the Lake." But, if you can't, there are always the souvenir salt-and-pepper shakers. "Come on up May 2 for International Loch Ness Monster Day," says Nessie Club President Gary Campbell, a 32-year-old accountant. "Does Bigfoot have his own holiday? I think not." Canada's Lake Okanagan and North Carolina's Lake Norman are just two other bodies of water inhabited by sea monsters — or at least that's what local tourist boards are telling adventure-starved visitors. Scape Ore Swamp in Bishopville, S.C., is even said to be populated by green, scaly Lizard Men who walk on two legs, much like the monster in the 1954 movie Creature From the Black Lagoon. 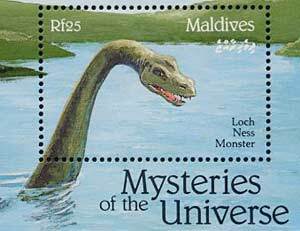 But, as least when it comes to notoriety, Nessie is still Queen of the Sea. Mothman: This year, Mothman, the red-eyed, 7-foot flying man-bird, got what every monster wants for everlasting fame — a major motion picture. The Mothman Prophecies, starring Richard Gere, told the story of the car-chasing, animal-mutilating critter that menaced the Appalachian town of Point Pleasant, W.Va., between 1966 and 1967. Several Point Pleasant residents say that when the town's Silver Bridge collapsed on Dec. 15, 1967, and 46 people died, Mothman's eerie squeal rang out. With a movie finally released, Point Pleasant had hoped to cash in on its infamy. The town prepared with cheap souvenirs (including Mothman Christmas ornaments), improved hotel accommodations, and tours. But the movie bombed. And even worse, Mothman may have returned. On Jan. 25, when the movie opened, the town suffered a blackout. Within the next six days, eight people died in traffic accidents — the most in 40 years, according to Loren Coleman, author of Mothman and Other Curious Encounters (Paraview Press). "The timing was not lost on the local town folks," Coleman says. 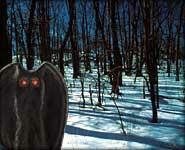 "It was as if Mothman returned. Folks there are hesitant to talk about it." Of course, if Mothman has returned, he might have a cousin in Alaska's Big Bird. And of course there have been dozens of other reports in recent years of monsters — even a flying Bigfoot reported on Washington state's Mount Rainier that's been dubbed "Batsquatch."